The Princeton Arts Council came to us because they wanted to provide their users an improved interface for searching class offerings on their website in addition to syncing this data with their FileMaker Pro database. 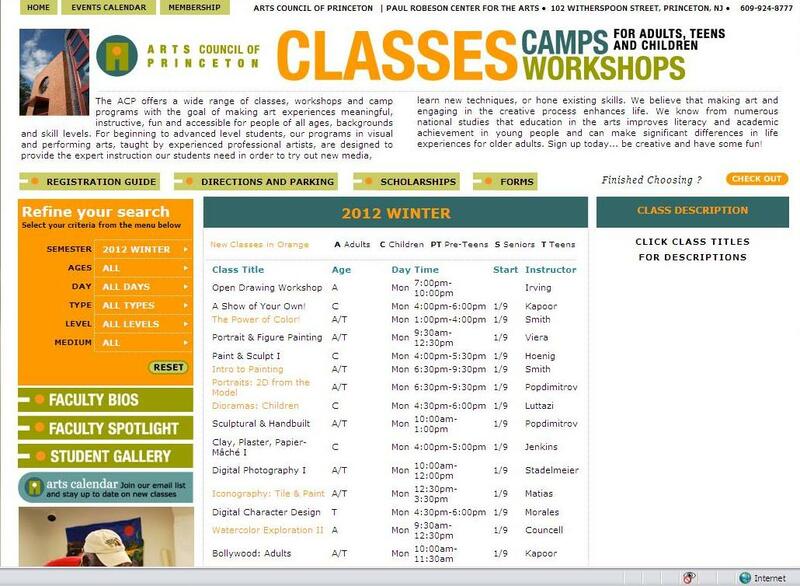 We built a special application for their Classes, Camps, and Workshop's page. This app syncs with their local FileMaker Pro database, populates online class registrations, offers granular searching capability, and offers unique class pages with printable class details. Our system also integrates with PayPal for checkout pages. To get set up with this application - as well as our other insanely cool and easy-to-use apps - contact us today. About ACP: The ACP offers a wide range of classes, workshops and camp programs with the goal of making art experiences meaningful, instructive, fun and accessible for people of all ages, backgrounds and skill levels. For beginning to advanced level students, our programs in visual and performing arts, taught by experienced professional artists, are designed to provide the expert instruction our students need in order to try out new media, learn new techniques, or hone existing skills.